Workholding Clamp | Miniature Pneumatic | GRM1 | PHD, Inc.
Series GRM1 Miniature Pneumatic Workholding Clamps are lightweight units with high clamp force and feature a cost competitive design. Series GRM1 Workholding Clamps provide 225 pounds of total clamp force, weigh less than a pound. These clamps are field repairable in 10 minutes using metric hex wrenches. 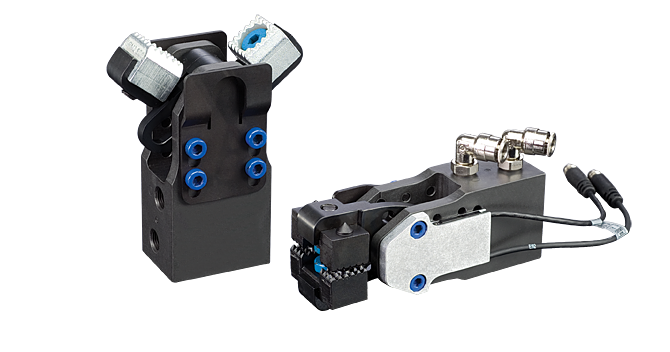 Proven cam-design technology locks the jaws in the closed position in the event of pressure loss, compact envelope size (45mm X 45mm X 120mm) for confined work spaces or robotic and end-effector applications, high clamp force to weight ratio, accepts all GRM2 standard tips, four standard jaw openings for design flexibility.